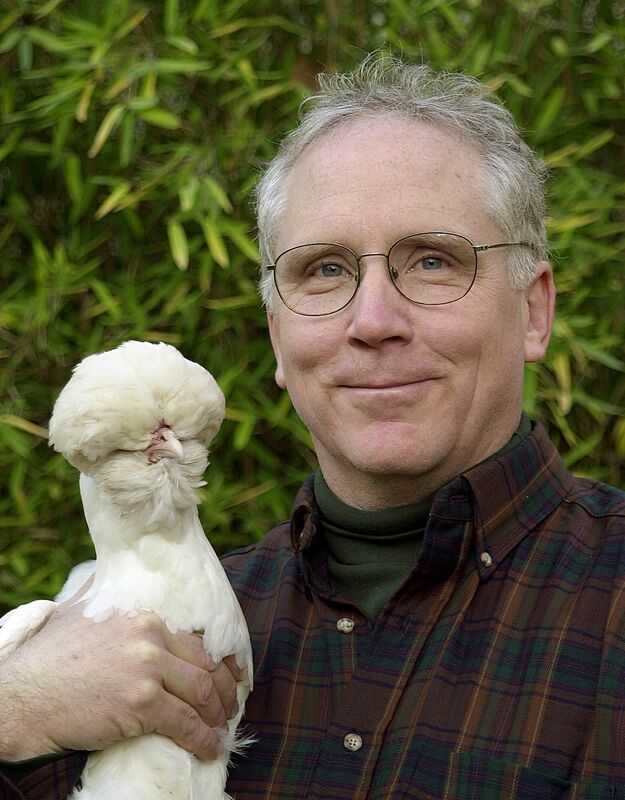 Jamie Dockery, wizard of farm and garden. August 12, 2017. I don’t know anyone on this planet, or galaxy, with more runaway enthusiasm for gardening than Jamie Dockery. And that’s not all. 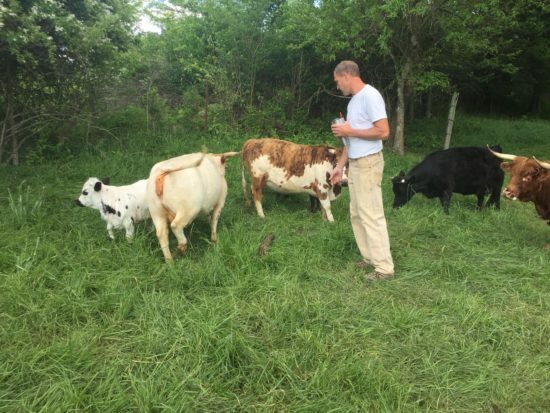 Besides his rabid determination to grow anything with chlorophyll, Jamie also raises little cows, little goats, chickens, ducks, donkeys, and tends an aviary with finches and canaries—all of this on his ten-acre farm in Salvisa, KY, not far from the Kentucky River. 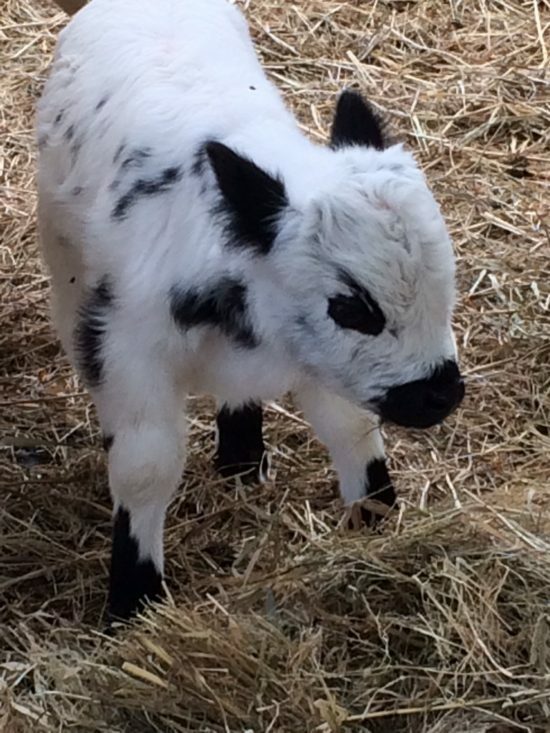 Ansel, the newborn, black and white calf. March 26, 2017. This was one of nearly 50 talks Jamie presents each year as part of his day job as the Fayette County Extension Agent for Horticulture Education. 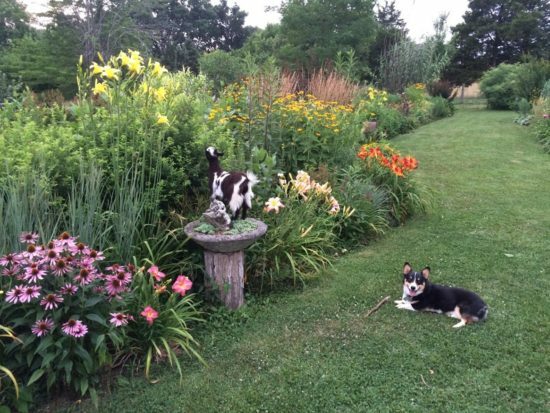 Jamie’s first love, after his livestock, is perennials, but he is no one-trick pony. He’s extremely knowledgeable on trees, shrubs, and fruits and vegetables, too. The little cows in early May. Jamie trials many new plants and vegetable seed items in Salvisa. At his recommendation, I have planted two disease-resistant apple varieties ‘Liberty and Enterprise’. And Jamie told Rose recently about the thornless Prime-Ark Freedom® Primocane blackberry variety that produce a second crop later in the season, on new growth. 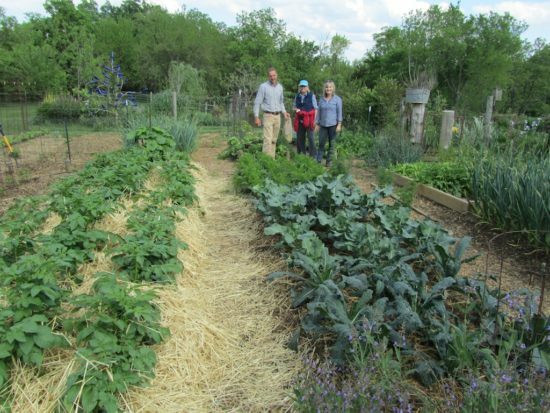 Jamie tours the vegetable garden with Tay Breene and Rose Cooper in mid-May. Jamie muscled through 200 slides in an hour and 40-minutes. There was not a dull moment. “You’re going to kill plants. Don’t worry,” he advised. “I avoid pastel colors; I prefer crayon box colors,” he said. 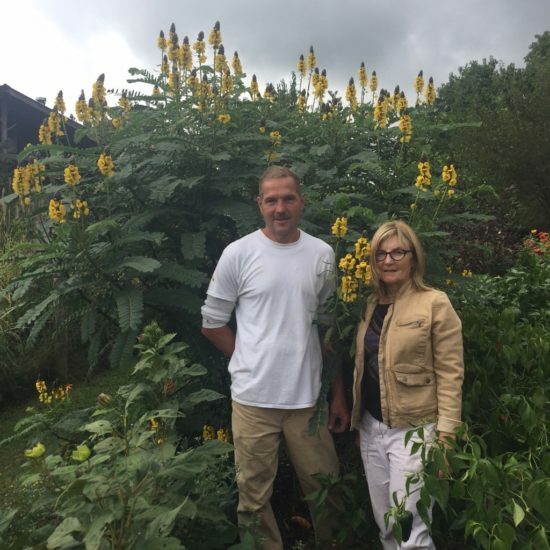 Jamie and Rose Cooper with the popcorn plant, Senna (Cassia) didympbotrya in early October. 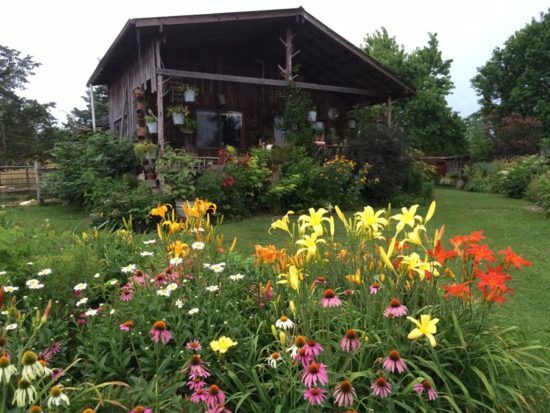 There was a slide with a “cacophony” of bright flowering daylilies including ‘Rainbow Towers’, ‘Lemon Madeline’, ‘Heavenly Dragonfly’ with Echinacea purpurea and Chrysanthemum ‘Becky’. Effie (L) and Diesel (R) along the summer border summer. Dockery photo. Summer Sorbaria sorbifolia. Dockery photo. Jamie also got excited (he’s easily excited) about the false spiraea, Sorbaria sorbifolia, with one caveat that momentarily knocked the shrub off stride for me: it is “vigorous” (meaning, suckering like crazy). Good advice, but that was only a teaser. 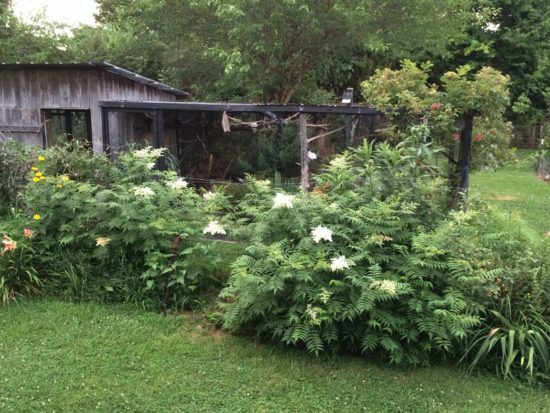 “It has ginormous astilbe-like flowers for two or three months and is disastrously beautiful,” he said. 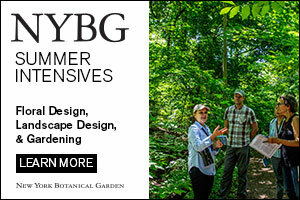 Jamie dares timid gardeners to be cautious of fads but not to be shy about trying new plants. Be patient; be bold. Cross the threshold to garden discovery. Jamie initially built a run-in shed in Salvisa for his goats, cattle and donkeys so they could be protected in inclement weather. He liked the animal shelter so much that he added a modified run in—a simple house (1500 sq. ft.) with a wood stove. There is no electricity. Summer daylilies—’Rainbow Towers’, ‘Lemon Madeline’, and ‘Heavenly Dragonfire’ with Chrysanthemum (Leucanthemum) ‘Becky’ and Echinacea. Dockery photo. The Salvisa farm and garden originated from a child’s dream of kittens, puppies and memories of the refrain, “No, you can’t keep that until you get older.” His patch of soil and sentiment is a walk back in time to a childhood of canned vegetables, medicinal herbs, no running water and big snowball bushes (Viburnum macrocephalum). 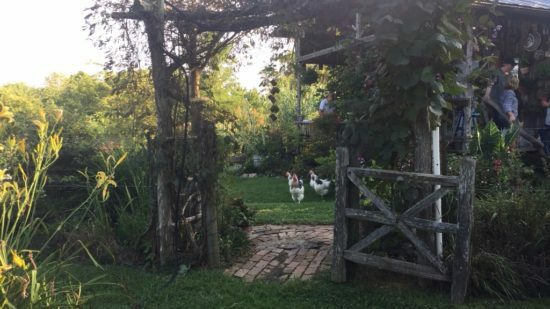 His farm and garden are homage to the self-sufficient lifestyle his maternal grandparents lived in rural Russell County, in South Central Kentucky, near Lake Cumberland. 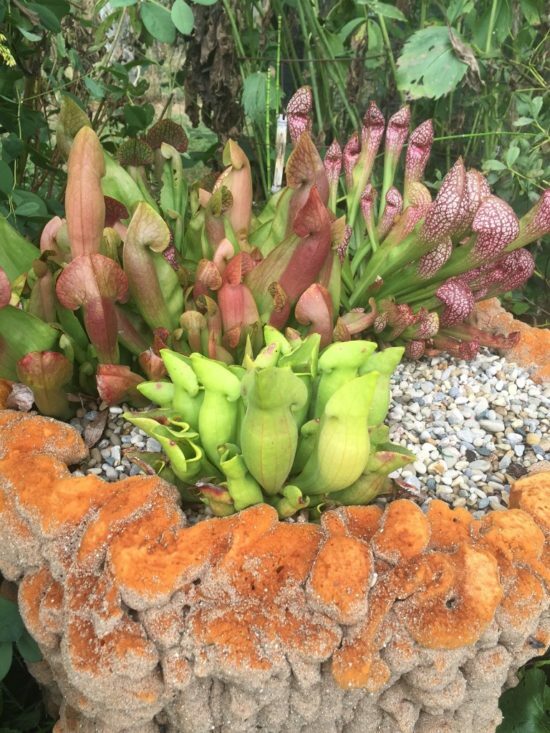 Potted carnivorous plants in mid-summer. Jamie grows a keepsake flameleaf sumac shrub, Rhus copallinum, harvested from from root stolons dug from his grandmother’s garden. The orange-red fall leaf color and bright-red seed heads are stunning. He soaks up inspiration wherever he goes. “I have taken hostages from everyone I met along the way, ” Jamie said. 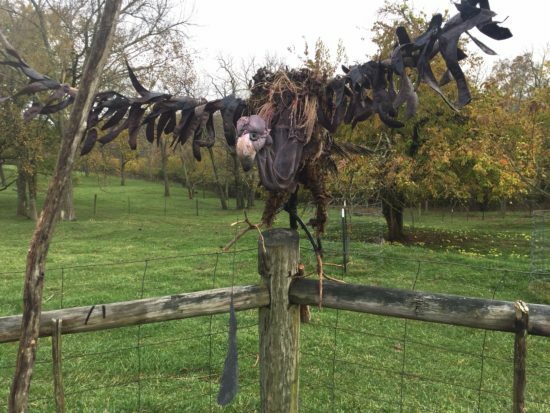 The buzzard has feathers made from bean pods of a honey locust. 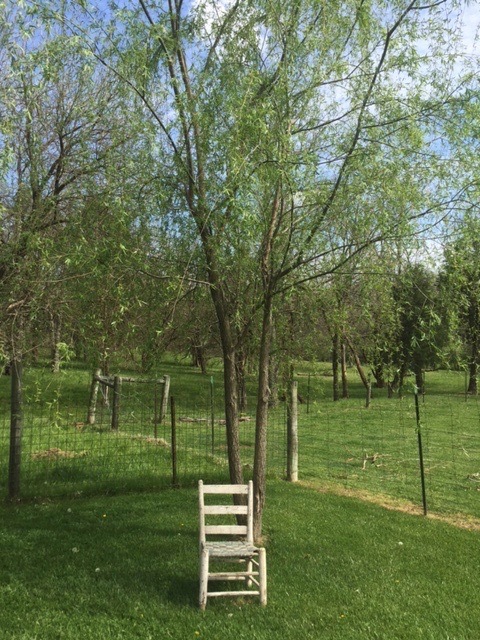 Osage orange tree in the background. 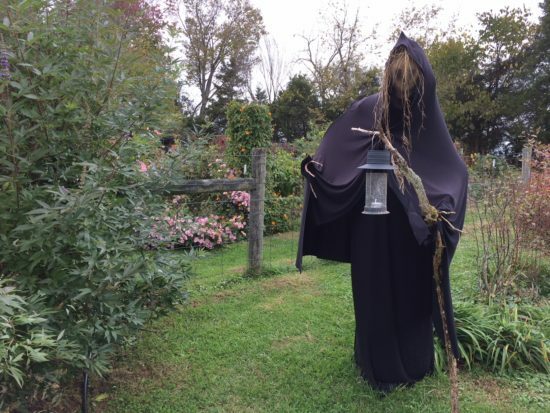 He invited friends—more hostages—out to the farm the weekend before Halloween. It was a raw, wet-cold evening. The vegetable garden was winding down. Light frost had already nipped the lablab beans. Jamie set up several fire stations to keep everyone warm. The gardening maestro’s luscious, lunatic garden was a backdrop for the season’s closing event. Jamie’s newly completed seasonal sculptures made their debut. Halloween ghoul with $10 bucks worth of Walmart fabric, burlap sack and nimblewill hair. Dockery photo. Now he is preparing for cold weather. Jamie never stops. Tender plants go to Lexington and spend the winter under grow lights in the basement of his Lexington home. His canaries and finches go to town, too. 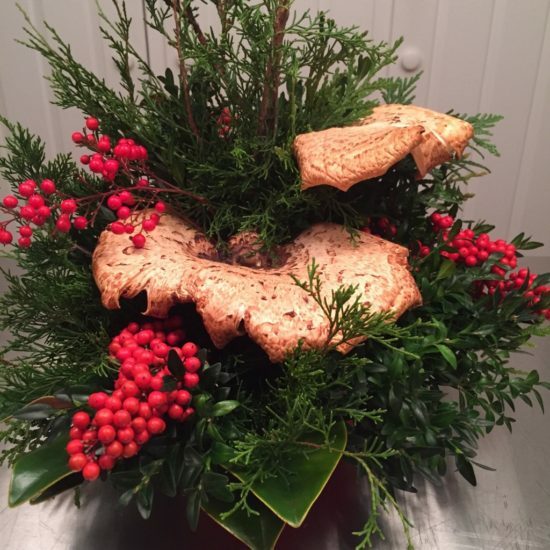 Our 2016 gift of Christmas greenery from Jamie. Christmas decorations will get underway soon. Jamie will start with sprigs of boxwood, Magnolia D.D. Blanchard, Nandina and red cedar (Juniperus virginiana) If he is lucky, he might add the beautiful pheasant back mushroom—if he finds one on a decaying log. And who knows what else. “I make the decorations for my friends,” he said. 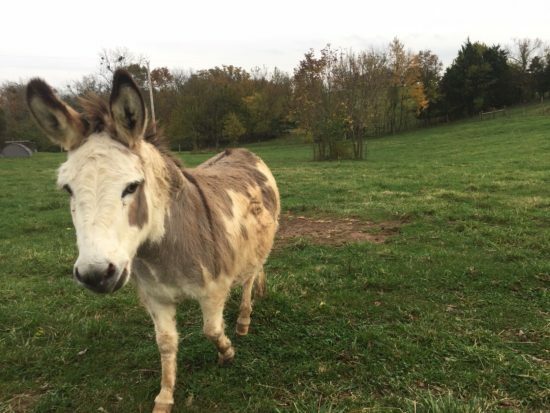 Little Dude, the noble donkey. He guards the livestock from coyotes. 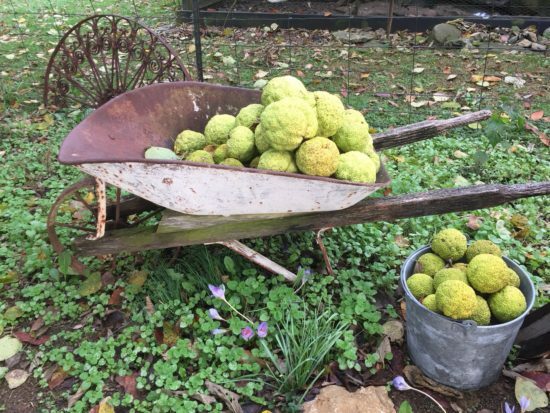 Plenty of Osage oranges to go around. Crocus speciosus in foreground. 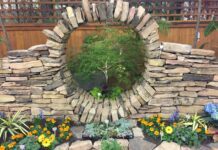 There is no need to call ground control when you’re held friendly hostage in the swirling orbit of Jamie Dockery’s lunatic garden. As any garden should be. 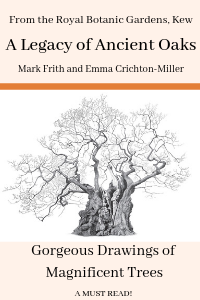 Previous articleAre Images of Gardeners in the Media Finally Improving? 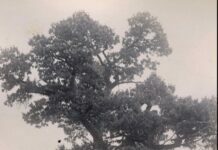 Next articleCan these Junipers be Saved? I loved this glimpse into Jamie Dockery’s “lunatic” side. I had the rare pleasure of working with him during my years as a Family Resource Center director for Fayette County Public schools. His enthusiasm for what he does is authentic and contagious. 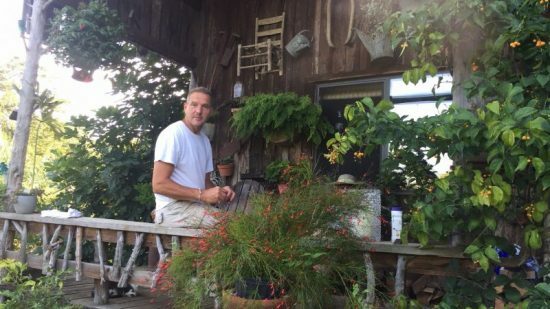 I had the pleasure of collaborating with him on several programs that highlighted not only his love of gardening but also his love for children and community. He is a class act and a bundle of fun to boot. Brilliant and creative! 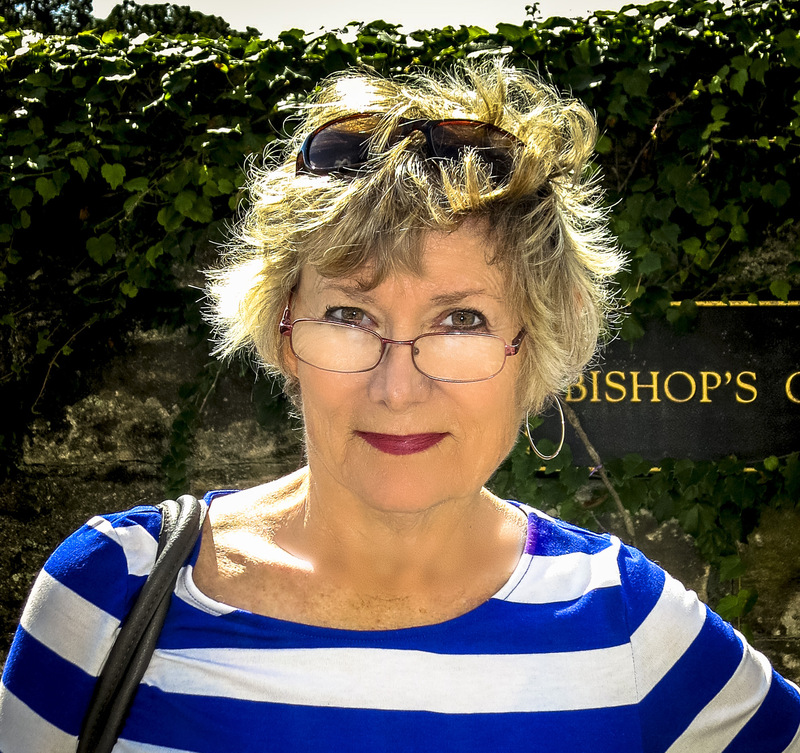 Thank you for taking time to present a most delightful garden and horticulturalist extraordinaire. When is his next presentation? I would love to learn from him. Jamie gives many classes at the Fayette County Extension Office in Lexington. I believe the newsletter is online or you can call to get on the mailing list. Thank goodness I’m not the only nutcase gardener in the area. Thanks for letting us see some of Jamie’s world. Best story ever! Thank you! Loved loved this story and want to see more! You are so clever and exciting with all your knowledge. Wish I lived closer so I could see it all in person, but you made my morning! Thank you! Wow, what wonderful photos, you really do have an incredible garden!! It’s really inspiring to see someone who is so passionate leading the life they want to, it’s an ideal that really isn’t the focus of most people’s lives these days. That’s a real shame, but seeing this great story really encourages me to keep going on the journey. Great profile! I love a bit of lunacy in the garden. What a magical place you’ve created, Mr. Dockery! 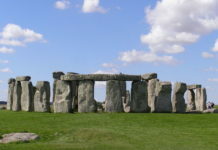 A fantastic childhood-fantasy-of-a-place for me, as well. Well done! How wonderful! The sort of lunacy that is inspiring and a corgi too! 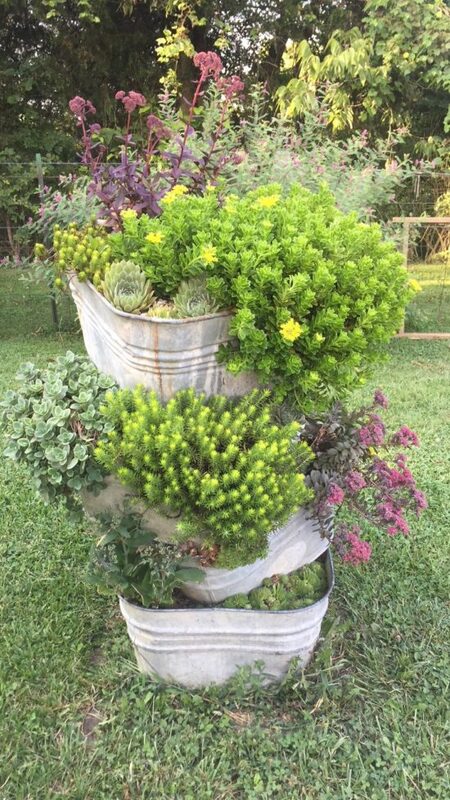 Thanks for reminding us that gardening is and should always be fun!